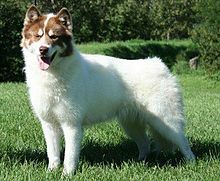 The Canadian Eskimo Dog is an Arctic breed of working dog. Another name for it is qimmiq, and it was brought to North America from Siberia by the Thule people. This page was last changed on 5 December 2018, at 21:22.